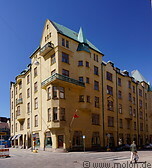 Central Helsinki is a pleasant city centre mostly built in neoclassical style. Kaisaniemi park is a popular park lying immediately to the north of the central railway station. Senate Square (Senaatintori in Finnish) is one of the main tourist attractions of Helsinki. Various art happening and events take place here.